The law of definite proportions is a law of science that says that a chemical compound is always made up of the exact same proportion of elements by mass. So, if a compound is made by combining 1/4 from one chemical and the remaining 3/4 from another chemical, these proportions will always hold true, regardless of the amount of chemicals added. The Law of Definite of Proportions is sometimes referred to as Proust's Law because it was originally observed by a French chemist named Joseph Proust. In the modern world, this law seems obvious, but in Proust's day it was a new idea, because some scientists thought that any combinations of elements could make certain substances, rather than the substance needing to be created by a definite proportion. Water, written as the chemical compound H20, is made up of atoms of hydrogen and oxygen. If one oxygen atom is combined with two hydrogen atoms, water is created. An oxygen atom has an atomic mass of 16, while a hydrogen atom has an atomic mass of 1. This means that water is made up of 11% hydrogen and 89% oxygen. The exact same proportion of hydrogen and oxygen must always be combined in order for water to be created. Water could never be created by combining a ratio of 20% hydrogen and 80% oxygen, because the proportions are not correct; a different chemical compound would be created by mixing this ratio. This was a revolutionary idea in the day of John Dalton, an English chemist who lived from 1766-1844, when it was thought that any combination of hydrogen and oxygen could be combined to create water. Salt, written as the chemical compound NaCl, is made up of atoms of Sodium (Na) and Chlorine (Cl). The exact same proportions of sodium and chlorine must always be combined in order for salt to be created. Sulfuric acid is made up of the individual elements of hydrogen, sulphur, and oxygen. The chemical compound is written H2SO4. The same proportions of hydrogen, sulphur, and oxygen must be combined to create sulfuric acid. Ammonia is a common household item made up of the elements hydrogen and nitrogen. It is written as NH3, meaning that there is one atom of nitrogen combined with 3 atoms of hydrogen. 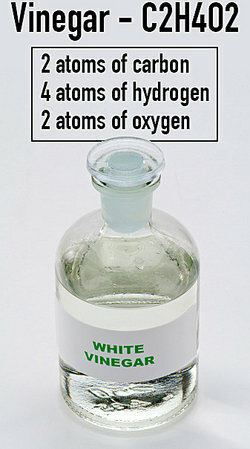 Anhydrous ammonia contains 82% nitrogen and 18% hydrogen. Any other combination of hydrogen and nitrogen would result in an entirely different chemical compound. Glucose is a chemical compound that is written C6H12O6. This means that for a substance be glucose, it must be comprise of 6 atoms of carbon, 12 atoms of hydrogen, and 6 atoms of oxygen. The carbon makes up 40.001% of glucose; the hydrogen makes up 6.714% of glucose; and the oxygen makes up 53.285% of glucose. It wouldn't work if you tried to create glucose with the carbon and oxygen equally represented by combining 45% carbon, 45% oxygen, and 10% hydrogen; the chemical compound that would result would not be glucose. Vinegar is another common household item. Its chemical compound is C2H4O2, meaning that it is made of 2 atoms of carbon, 4 atoms of hydrogen, 2 atoms of oxygen. No other combination of carbon, hydrogen, and oxygen could be combined to create vinegar. The Law of Definite Proportions ensures that chemical compounds are always created using the same proportions, regardless of the amount of the compound which is being made. "Law of Definite Proportion Examples." YourDictionary, n.d. Web. 23 April 2019. <https://examples.yourdictionary.com/law-of-definite-proportion-examples.html>. The law of definite proportions is a law of science that says that a chemical compound is always made up of the exact same proportion of elements by mass. So, if a compound is made by combining 1/4 from one chemical and the remaining 3/4 from another chemical, these proportions will always hold true, regardless of the amount of chemicals added. The Law of Definite of Proportions is sometimes referred to as Proust’s Law because it was originally observed by a French chemist named Joseph Proust. In the modern world, this law seems obvious, but in Proust’s day it was a new idea, because some scientists thought that any combinations of elements could make certain substances, rather than the substance needing to be created by a definite proportion.